Thus, episode 2 of Triangle Transit's new marketing campaign, As The Bus Stops. 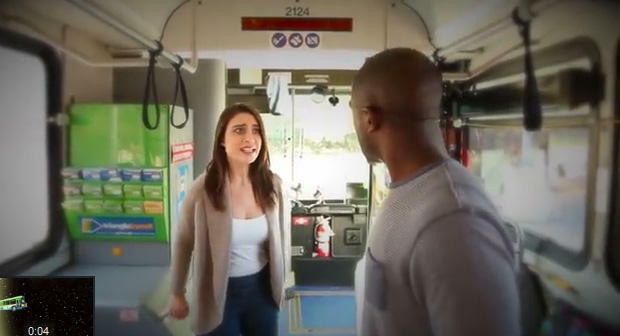 Conceived (pun intended) over a lunch between Lauren Parker and Damien Graham of Triangle Transit's communication team, As The Bus Stops is the organization's attempt to make public transportation approachable in a city that doesn't have quite the same appreciation for shared seats as New York or LA. WUNC's Catherine Brand talks with Lauren Parker, Marketing Manager for Triangle Transit Authority about "As The Bus Stops." Parker and her team got together and made two lists; First, a list of all the services they would like potential riders to know about; Second, a list of all the tropes of a good soap opera. Put them together and and it's only a matter of time before the research triangle becomes the love triangle. There are three episodes on Youtube right now. Two more or written. No word yet on syndication.